Before starting your hike we suggest a visit to the National Park Visitor Centre TorfHaus. Here you can obtain much information about the area and also procure a good map of the walking trails. A short tour of the exhibit, presentations and slide shows will show you many things you won‘t want to miss on your tour to the Brocken Mountain and introduce you to the unique landscape. During inclement weather or if a hike to the highest elevations of the Harz should be too strenuous, there is the opportunity to take an audio-visual tour. The Visitor Centre is located in the Torfhaus settlement, which has a long history. In 1713, when the first cutting of peat in the surrounding moors began, the first building was erected. Torfhaus became known beyond its borders after the German writer Johann Wolfgang Goethe who, accompanied by the Torfhaus forester Degen, began his first ascent of the Brocken on December 10, 1777 from here. The climb through the rough terrain in heavy snow left a lasting impression on the poet. The experience of untouched nature and the joy of having reached the summit gave him new creative impetus. 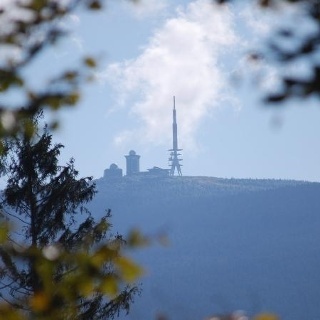 Goethe incorporated these Brocken impressions in his famous tragedy „Faust“ - bringing world renown to the Harz. Exactly which route Goethe took at that time to reach the Brocken peak (1,141 m above sea level) can no longer be determined. It is not exactly the route named „Goethe Trail“ today. Using public transportation, we reach the Goethe Trail by way of the train to Bad Harzburg, and from there with the bus to Torfhaus. 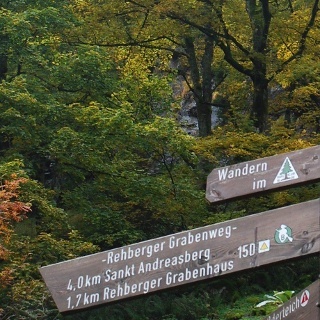 Useful information about hikes can be obtained at the National Park Visitor Centre TorfHaus, Tel. 05320 33179-0, Fax 05320 33179-19, email post@torfhaus.info, www.torfhaus.info or in the ranger station on the other side of the street (Tel. 05320 269). We begin at the National Park Visitor Centre Torf-Haus at the large car park Torfhaus, following along the B4 in the direction of Braunlage for a short distance to the bus stop. In the immediate vicinity of the bus stop is the actual beginning of the Goethe Trail. Leaving the buildings of Torfhaus behind us we follow along the Goethe Trail, turning to the right into a forest of spruce trees. During the summer months we soon turn off to the left onto a wood board walk. Here the woods thins, revealing a large slightly mounded piece of ground. We are in the middle of the Great Torfhaus Moor, also known as the Radauer Born Moor, a high elevation moor which is one of the largest and oldest in the Harz. Its origin dates back to 8,300 B.C. The moors are among the most untouched of the Harz National Park‘s natural landscapes. They provide unique environments which are gravely endangered, offering special habitats in which the plant and animal species adapted to these conditions can survive here. In the Great Torfhaus Moor grow, among other interesting plants, the dwarf birch and common bog sedge - two plants which are considered to be relics of the Ice Age. The most important moor plants are the peat mosses which form a thick lawn here. With sufficient moisture they continue to grow in height while the lower portions die and form peat. In this manner the Great Torfhaus Moor has built a thick layer of peat measuring 6.5 m maximum depth, seldom even in the Harz. We follow along the man-made water channel, the Abbegraben, which was built after Goethe‘s walk. This 1,540 m long channel is a part of the Oberharz Water Mangaement national monument - a many-faceted system of ditches, lakes and underground water courses, which was built between 1536 and 1866 under great effort by the Harz miners to power their various „Künste“, that is, their mechanical inventions to facilitate mining. Although Goethe had to wind his way through difficult terrain, today we use the comfortable walking paths. We reach the Quitschenberg, on which in Goethe‘s time many „Quitschen“ or rowan trees grew. 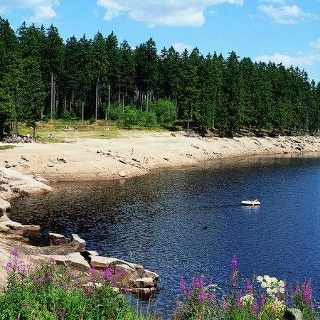 Because the mining process devoured such great quantities of wood, the forests were replanted with fastgrowing spruce trees. Many of the spruce trees you see around you are dead, killed by the bark beetle. It, too, is a natural inhabitant of our forests. In masses they are able to kill the spruces, already weakened by environmental influences, in a short time. On the Quitschenberg, however, in contrast to the usual practice, the multiplication of bark beetles is not curtailed by chain saws, peelers or traps. On the Quitschenberg, nature is left to heal herself by her own devices. The first positive results can be seen: many sunlight hungry rowan trees have overtaken the bare spots. Soon the first spruce trees will followed and a new forest arises. 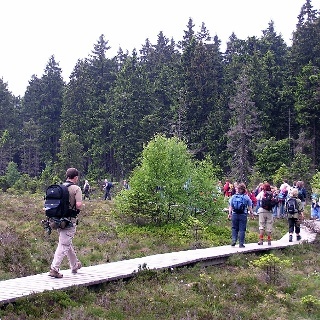 The National Park offers us the unique chance to re-naturalise the spruce forests of the High Harz. Very gently the natural transition of the former cultivated forest to natural woodland is being encouraged. time took only nine months, in spite of great difficulties. 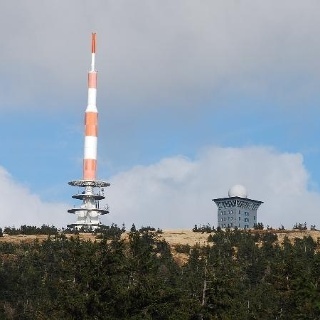 On the 27th of March 1899 the first train reached the top of the Brocken. In those days the train ran seasonally, providing transportation to the summit of the Brocken only from April 30th to October 15th. 51,209 people rode the Brockenbahn to the mountaintop as early as 1900. It had become a popular place for outingssince Goethe‘s ascent. As we continue along the track of the Brockenbahn we can observe the characteristic vegetation of the Goethe Moor along the sides of the track. The plants of the high moors are especially sensitive to trampling, making the absolute protection of this area mandatory for its preservation. Too much damage was already done during the cutting of peat here between 1745 and 1776. The cut peat was dried in a very complicated process and then charred for subsequent use in ore smelting. This was an effort to counteract the increasing shortage of wood for use in the mining industry. Forester Degen also pointed out the importance of the moors to the Harz water household to Goethe and awakened his understanding of this unusual environment. The view across the Goethe Moor is splendid, especially in early summer when the cotton grass is in wooly flower. (www.nationalpark-brockenhaus.de). The numerous interesting presentations here provide information about the Harz National Park, the local flora, fauna, and geology as well as the climate and the changing history of the Brocken. From here we begin our descent, using the same trail. The most environmentally friendly access is by train to Bad Harzburg on the northern edge of the Harz. From here you can travel by bus to Torfhaus. The bus stop „Torfhaus“ is the starting and finishing point of our hike. 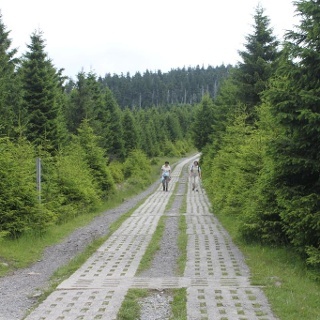 Along the 8 km (16 km up and back) pathway you can experience the Harz National Park from various perspectives. Approximately 330 m elevation change is covered, but the path is easily walked and the climb not difficult. You should, however, be sure to allow adequate time (for up and back about 5 to 6 hours) and bring sturdy shoes. Useful information about hikes can be obtained at the National Park Visitor Centre TorfHaus, Tel. 05320 33179-0, Fax 05320 33179-19, email post@torfhaus.info, www.torfhaus.info or in the ranger station on the other side of the street (Tel. 05320 269).